"Kids can spell words and anything else they can think of." "It takes just seconds to set up—just pop it up and insert support rods to stabilize." "It’s safe and easy for little legs to get the hang of it." "This vibrantly colored dollhouse promotes interactive play at every level." "Features three fun activities, three action challenges, and five different games." "None of the mess that paint and markers can make." "They can sit in it, stand on it, wiggle it, wobble it, rock and roll on it." "Their stuffed animal collection is the stuffing on this bean bag chair." Everyone always says not to play with your food, but no one ever said anything about your drinks! These Spelly Straws are a smart, fun way to do just that. In a word these things are brilliant. Seriously, you’ll wonder why no one thought of them sooner. 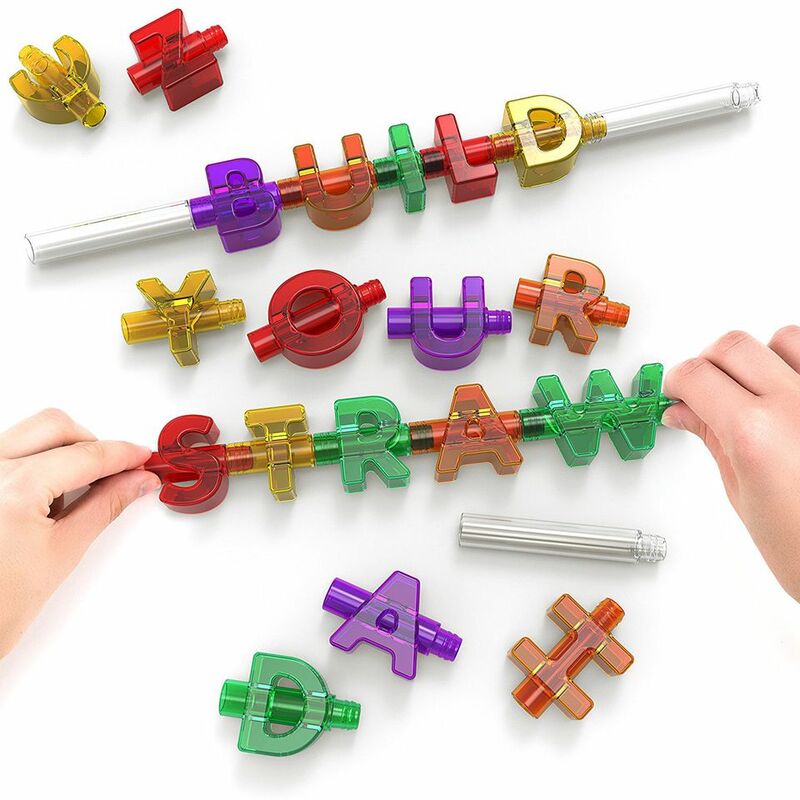 The pack comes with 44 colorful letters and four straw connectors that all easily snap to one another to make the funnest reusable straws you’ve ever seen. Kids can spell words, their names and anything else they can think of, then just snap on the straw ends and sip away. The beverage of their choice will flow through the letters and make their drink taste even better (or so we will assume). While adults love them (W-I-N-E), they’re an especially cute and creative gift for preschoolers learning to spell. The price is right (inexpensive that is), and they’ll be a hit with boys and girls alike. Every little princess needs a castle, and this one is a royally great gift. After they slay dragons, rule their kingdom or whatever else they dream up, they can climb in their perfect little place to rest, recharge and dream about their next adventure. In their kingdom anything goes, and imagination is king. It’s decorated with hearts and glow-in-the-dark stars for extra magic, and there are fold-down flaps on both the door and windows for when the princess needs her privacy. It’s big enough for a couple little rulers too. Royal tea party, anyone? It takes just seconds to set up—just pop it up and insert support rods to stabilize it. When it’s time to pack up, it easily folds down flat. It can be used indoors or outdoors and comes in a lightweight zippered case that makes it easy to take wherever her royal highness requests. Read more reviews of the best children's playhouses and tents to purchase online. This pogo stick for little jumpers is a great, active gift. Made of foam, it’s safe and easy for little legs to get the hang of it. Even better, it comes equipped with a built-in squeaker that makes a noise with each bounce—perfect for counting each jump. The foam base is connected to handles by a stretchy “spring.” All you have to do is put you feet on top and start to hop. This one comes in pink, but if that’s not her thing, it comes in other colors too like orange, red and blue. While it’s designed for little ones (ages 3 and up), it does support up to 250 pounds, so the whole family can take turns. Strong and durable, it can be used indoors (the foam won’t scuff floors!) and is a great way to encourage physical fitness through fun. Not every four-year-old girl adores dolls, but for those that do, the Fisher-Price Little People Big Helpers Home is an ideal gift. Little girls (boys too!) will go gaga over this interactive dollhouse! This spacious, vibrantly colored house promotes interactive play at every level, with its two stories, multiple rooms, and hands-on features. Kids can actually press a button to activate the light in the kitchen, and there are several buttons that emit fun sounds, songs, and phrases, all of which are designed to teach kids teamwork and the value of taking care of others and the home. The Fisher-Price Little People Big Helpers Home comes with figures Emma, Jack, and the Dogs, in addition to a dog bed, dog bowl, and two bar stools. Need some more help finding what you're looking for? Read through our best dollhouses to buy for kids article. She’ll be stylin’ just like the big kids with this awesome smartwatch designed just for kids. Beyond just a pretty accessory to wear, it’s packed with all sorts of fun features for on-the-go activities. Not only can you take pictures with it, but it also has video recording and voice recording capabilities as well as special effect tools. Other features include three fun activities, five games, three action challenges and a motion sensor. There’s also an alarm, a timer, a stopwatch and a calendar. All that right there on her wrist! Oh, it tells time too. This well-priced magnetic doodle board makes a great gift for any occasion. With the attached pen, little artists can create works of art to their hearts' delight. Once a masterpiece is complete, they can easily slide the eraser bar at the bottom, and voila!, a fresh new canvas for the next one. It also includes four shape stampers (a square, triangle, circle and star) for extra special touches. Beyond art, the Doodle is also a great way for them to learn letters, how to write their name, math facts, and how to spell. It can also be used for family games like tic tac toe and Hangman. Most anything you can do with pencil and paper, you can do on the Doodle. It offers all of the creativity, but none of the mess that paints and markers can make. It’s also lightweight and a great entertainment option when traveling—no more lost pen caps under the airplane seat! So, no one may know exactly what it is when they open it, but once they figure that out, the Teeter Popper is sure to be a hit. Like nothing else they’ve ever seen, this is one versatile, active toy that’s loads of fun. It’s recommended for ages 3-10 and holds up to 110 pounds, so little ones will get years of fun from this gift. If you know anything about 4-year-old girls, you know they often can’t be spotted in their bedrooms and playrooms because they’ve been overrun by stuffed animals. This amazing bean bag chair can store them all, and give them the perfect rebuttal when mom says there’s no room for one more. The animals make up the chair’s “stuffing,” so they also get a fun seat to read on, watch television on or roll around on. It also comes equipped with a pocket perfect for holding a book, remote control or other treasure. The best part is that when they want to play with their furry friends, they can just unzip the chair, take them out and put them back when they’re finished. The cotton fabric can be machine or hand washed, and it comes in eight different colors and patterns that will match any decor. It’s a great gift for girls, but mom’s going to love you for this one too. We bought three top-rated gifts for 4-year-old girls and our reviewers tested them for weeks on end. We asked our testers to consider the most important features when using these gifts, from their educational value to their age-appropriateness. We’ve outlined the key takeaways here so that you, too, know what to look for when shopping. Age-appropriateness When shopping for a 4-year-old, check a toy’s age rating to ensure that it’s a good fit. Toys for toddlers might not keep a 4-year-old engaged, but a product that’s too complicated may leave her frustrated. Educational value The best gifts aren’t just fun — they’re educational, too. That doesn’t mean you have to buy her a textbook, though; many of today’s top toys encourage creativity, critical thinking, and STEM skills. Look for one that’s the perfect combination of educational and entertaining. Interests When shopping for a 4-year-old girl, the ultimate deciding factor should be her interests. For example, if she loves science, a dollhouse may not be her cup of tea. Think about the toys she loves now, and when in doubt, don’t be afraid to ask her what she’s into lately — most 4-year-olds will be happy to tell you! One of our testers loved these straws because they were easy for her 4-year-old to use, as well as educational: “They’re an engaging way to sneak in some reading and spelling while kids are drinking water or juice,” she explained. Plus, noted one reviewer, they’re reusable, which “makes them an excellent alternative to plastic straws.” One tester, however, had trouble cleaning them in the dishwasher: “The box says that they are top rack dishwasher-safe,” she said, “but when I tried this, they emitted an unpleasant burning smell at the end of the cycle.” Our reviewers also wished that the set came with more extra letters.